Bloomsburg University's Frederick Douglass Institute has a long history of success in advancing the academic and scholarly careers of Doctoral students from diverse cultural backgrounds. 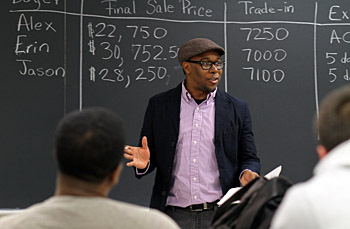 In keeping with Frederick Douglass' life of public service and commitment to equity and access, BU's Frederick Douglass Institute is offering teaching opportunities to graduate students entering the final year of terminal degree and/or doctoral programs and recent graduates who are pursuing careers as university faculty. In previous years, Frederick Douglass scholars have moved into successful academic careers at BU and elsewhere. The experiences gained through this program have been invaluable in their future teaching and scholarly success. The Frederick Douglass scholar’s opportunities are consistent with BU values of collaboration, community, critical thinking, diversity, excellence, integrity, knowledge, opportunity, personal and professional growth and respect. In addition, a critical goal is to develop and retain these scholars to have maximum impact on BU's campus. Preferred: teaching experience; currently ABD or doctorate within last two years. Applications submitted by March 15 will be given priority consideration, however applications will be continuously reviewed and considered. Frederick Douglass Scholars Fellowships are designed to provide professional experiences, mentoring and potential employment opportunities within universities that are strongly committed to cultural diversity. Applicants from diverse cultural backgrounds, especially those from historically underrepresented groups are encouraged to apply. As a Frederick Douglass Scholar, awardees will be provided an opportunity to teach full-time, develop a research agenda and provide service to the university during the Summer Sessions or full academic year (depending on term of appointment). Dates of employment typically run from May thru August for Summer appointments or August thru May for full-year appointments. Scholars will be compensated as adjunct faculty, according to the university's collective bargaining agreement. Additionally, Fellows may receive assistance with housing and travel. Faculty benefits, including office space, computer and network access and library privileges are provided. The appointment is for the scholar alone, not families, and scholars are responsible for their own local transportation. Contact Mark Bauman, Ed.D., interim vice provost and dean of undergraduate education, for more information about the Frederick Douglass scholars program and particular programmatic opportunities at Bloomsburg University at mbauman@bloomu.edu or 570-389-5430.